Microsoft is going to remove the unlimited storage for Office 365 users, reducing it to 1TB of storage, Which could be a decent idea, some people will put a lot up if they get that ability, but they are also reducing free storage. Their free storage will be dropping from 15GB to 5 GB, and they’re removing the 15 GB bonus for using OneDrive for your ‘Camera Roll’. From what they’re saying all of those will take effect in 2016 for all users. They’re also going to be removing their paid 100 and 200GB Plans for new users, reducing the maximum one to 50 GB. People who are currently on the 200 and 100GB Plans will be able to keep their storage. Which is good, I guess. It’s possible that they’re having issues with making a profit off of OneDrive, similar to Canonicals’ Ubuntu One cloud file storage which shut down back in 2014 which appears to be because it didn’t make enough money. This is also a good reason against using cloud storage, as it could just go away at any time. From what I’ve heard in the past, some cloud storage have providers just vanished. For now, I’m going to stick with my ownCloud, which I can run off of my own server, which I have full control over. I’ve also been hearing some people talking about ‘Syncthing‘, which I might take a look at soon as well. That’s it for today, have a nice day. If you want to read more about the changes to OneDrive, you can read it on the OneDrive Blog. A few days ago, another article about those random Windows 10 Autoupdates came up, this time saying that there was a mistake which caused some peoples machines to upgrade to Windows 10. From what they’re saying it did need some level of human interaction before the machine would restart to do the upgrade. Now they’re saying that at some point next year they’re going to change it from ‘Optional’ to ‘Reccomended’, which will cause machines that have Windows Update set up with the default settings to download and attempt to install Windows 10. They say that it’ll still need the owner of the machine to click through a few prompts first. Part of me wonders if they’ll set Windows 10 to be an important or critical update before their ‘upgrade for free during the first year’ time is over, it looks like they may go that way… I wonder how many people would get angry if they did that. Part of me thinks that Microsoft is pushing Windows 10 onto people who have disabled or removed the ‘GWX.exe’ which displays the ads for Windows 10, as those people appear to be the ones getting the forced upgrades. 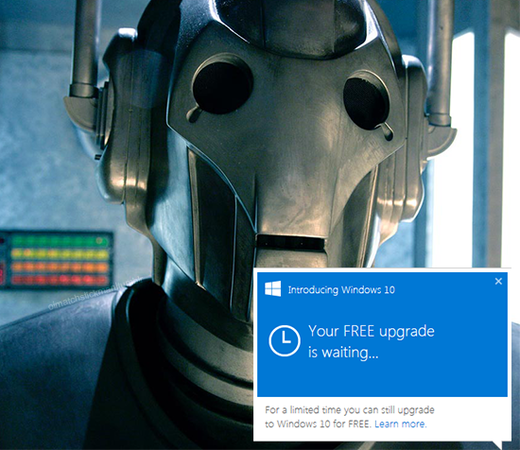 If that is the case, I wonder if Windows 10 will be pushed on everyone around the time that the ‘Free Year’ is up. From what I’ve seen, Microsoft *REALLY* wants everyone on Windows 10, the messages on my Windows 8 laptop have been becoming a bit more… pushy?… essentially telling me that I have to upgrade soon, but so far it hasn’t forced anything on me. The constant ‘Upgrade now!” messages have begun to leave a bad taste in my mouth though. For now, I plan on keeping Windows 7 and 8 around, as both are still useful. Also I miss some of the customization options that Windows 7 (and older) had. No decent transparency, and no color customization beyond titlebars isn’t nice. At least Windows 10 will have titlebar customization again soon… yay… At least the windows won’t need to be pure white any more. Click here to see an interesting article about this issue. I’ve used Windows 10 for quite a while, and today a new ‘Insider Build’ was released, which finally re-introduces coloured title bars. Windows 10 has really made me dislike pure white screens, because there are far too many of those in the OS. Sure I could have used one of the ‘High Contrast’ themes to get the look that I wanted, but doing that causes other issues in the appearance of the Operating System. Windows 10 is many times faster than windows 7, and the new task manager, which was introduced in Windows 8, is many times better and more informative than the older one which Windows 7 uses. The start menu has more features than it did in Windows 7 or 8.1, I’ve managed to pin some document folders to the Windows 10 start menu, which can be very useful. Cortana appears to be fairly useful too, though I haven’t made much use of that feature. On the other end, some of the new ‘Universal App’ stuff has made the operating system feel a bit more unstable. Things like the start menu not appearing when you click on it can be very aggravating. Also for some reason I’ve had the sound system fail on two different Windows 10 machines in one day. In the end both times it appears to have been a larger issue at hand, as not too long after the loss of the sound system, other applications began to have errors, requiring a forced restart on both machines. In the end, Windows 10 is a good operating system, it’s good enough for most people, though it just feels that the new ‘Universal Apps’ can be buggy at times. I still prefer Linux (Even though I haven’t been posting much about Linux recently…), but I’ll use Windows 10 without any major complaints. Windows 95 was released on Aug 24 1995, 20 years ago. It caused a number of changes in how people used their computers, it introduced the Start menu which many people use almost every day. If you want to read more, you can read this interesting article about how Windows 95 changed desktop computing. The fine folks that are making the Dig Build Live have made a … interesting… 360 video. As with last time, i’ll probably work best in Google Chrome, though it appears that Firefox has added 360 video support. Internet Explorer and Microsoft Edge (For those Windows 10 users out there…) do not support 360 videos at this time. You should also be able to view it on your smartphone, using the Google Chrome browser, the Youtube App, or the Google Cardboard App. Minecraft Windows 10 Edition (And Windows 10) are out. Well, today is an interesting day, A new version of Minecraft has been released, alongside Microsoft’s new OS. You can get the Minecraft Windows 10 edition Beta via the Windows store on Windows 10. If you already have the PC Edition of Minecraft, you can get the Windows 10 edition for free. You can get the instructions at the Mojang site. Oh yeah, Also today is the release day for Windows 10. Everyone that reserved their upgrades will start getting it in the near future. Otherwise I think that that’s all of the news I have right now. Mojang has announced Minecraft: Windows 10 Edition Beta, which will be available through the Windows 10 store on July 29… A day after Windows 10 is offically released. You can read the post on the Mojang website. From what they’re saying, Windows 10 Edition is based off of Minecraft PE, and players on the Windows 10 edition will be able to play multiplayer with both other MCPE and Minecraft XBox one editions. I do find it strange, both the XBox one and PE versions of minecraft have features which the other one doesn’t have. I wonder how that’ll work, I guess time will tell. I feel sad that they don’t have Linux on the list of platforms that Minecraft is available on, as I generally play Minecraft on Linux, as it seems to run a bit more smoothly there. Here’s their list of systems that you can run Minecraft on. Minecraft is available on Windows, Mac, Windows Phone, iOS, Android, Xbox 360, Xbox One, PS3, PS4 and PS Vita, and now, Windows 10. Oh and Mojang also showed a preview of the new game – Minecraft: Story Mode, made by Telltale games. I haven’t played any of their games, but I have heard that Telltale games does make some nice story-driven games. I wonder what their Minecraft story will be like. Well anyways, have a nice day.